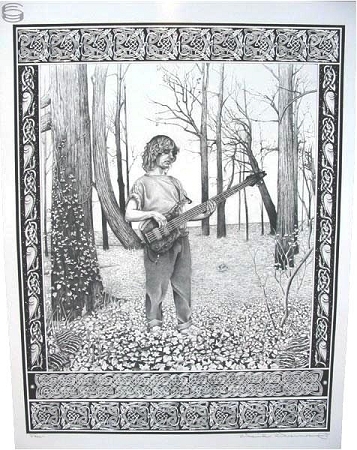 This is a mint condition poster of band member Mike Gordon of Phish. An original fan art design by artist David Drennon. It is printed on heavy glossy cardstock. This poster measures approx. 20" x 24". Poster is signed by the artist himself in ink. It would look great framed with the other 3 members. I stopped by the new store up in Lake Zurich and laid my eyes on the set of four posters, they are beautiful! I didn't bring enough money to purchase all four at once, but these are high quality posters nonetheless. It wasn't too hard to find a cheapo frame at a craft store that fit the poster. These posters are really worth the buy provided you have somewhere to put them; personally, I keep mine over my bed, it's like Mike Gordon is the guardian of the night in my bedroom.